New Delhi : The Prime Minister, Narendra Modi, on Sunday released two commemorative coins, as part of the 125th birth anniversary year celebrations of Dr. B.R. Ambedkar. Union Ministers Arun Jaitley and Thawar Chand Gehlot were present on the occasion. 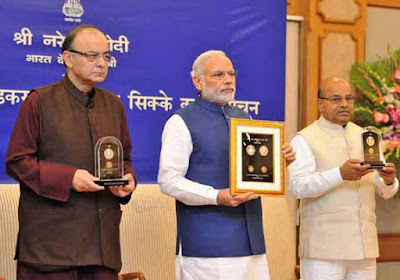 The coins, which are of "ten-rupee" and "one hundred and twenty-five rupee" denomination, were issued on the Mahaparinirvan Divas of Babasaheb Ambedkar. Speaking on the occasion, the Prime Minister said that there were only a few individuals who remain alive in public consciousness, even 60 years after their death. He said the more we recall Dr. Ambedkar's thought, in the context of issues currently faced by India, the more we come to respect his vision and his approach to inclusiveness. The Prime Minister said that while his contributions towards social justice have been recognized, his economic thought and vision is still not fully understood, and it needs to be appreciated. The Prime Minister said Dr. Ambedkar and the Constitution of India should always be discussed and talked about in this country, and the observance of Constitution Day on November 26th, was a step in this direction. The Prime Minister Narendra Modi appreciated Dr. Ambedkar's vision on subjects such as women empowerment, India's federal structure, finance and education.